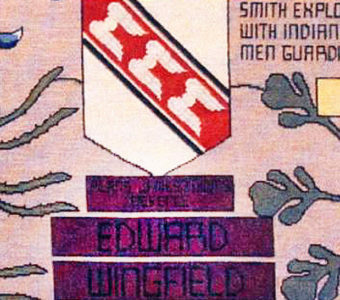 On February 21, 1989, WFS represent­ative, Vance Wingfield of Ft. Worth, Texas placed the first stitch in the 1607 tapestry depicting England’s establishment of the first permanent colony in the new world. The ceremony was in Bideford, Devon is for one of the eventual 23 canvas em­broidery panels each 11 feet wide and four feet high. 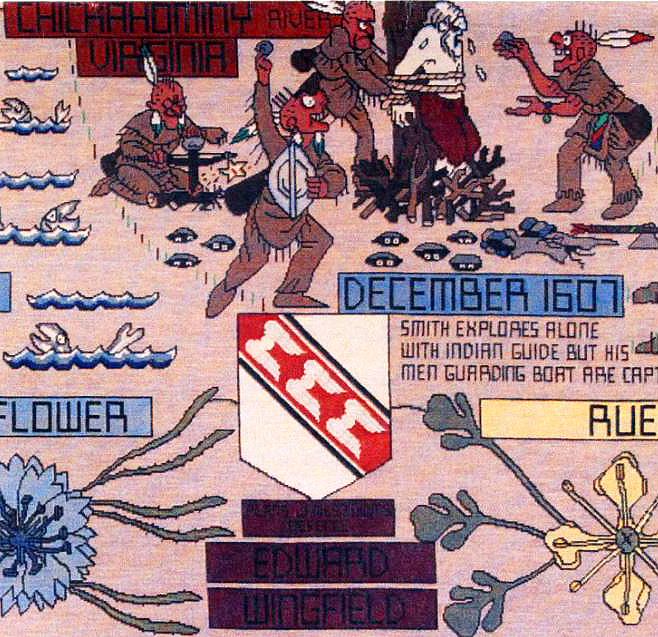 Tom Mor, an English artist is the originator of the tapestry that visually shows the story of England’s attemps to colonize Newfoundland, Bermuda and America be­tween 1583 and 1642. 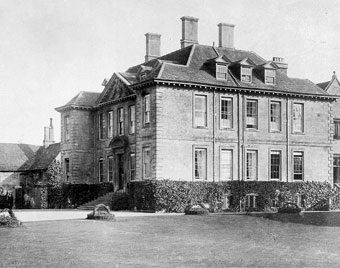 The tapestry pro­gram was begun in 1976 and is being em­broidered by teams of dedicated volunteers in Devon and Dorset. The final home for the complete work is as yet undecided, but completed panels can be seen in Plymouth. When all are completed, they will be join­ed together and form a panorama 253 feet in length which is longer than the Bayeaux and over twice the area. The Bayeaux tapestry is an embroidery on canvas, using the Oblique Gobelin Stitch. 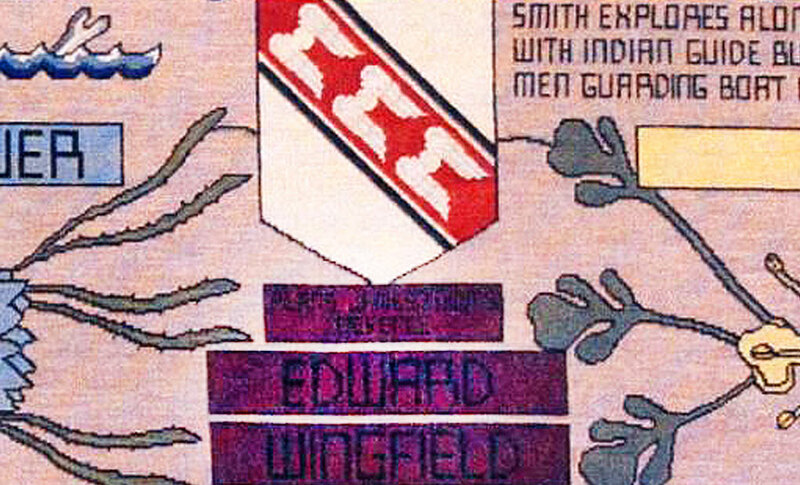 The tapestry is designed in a strip cartoon form. According to Tom Mor, this simple format is one that children can understand most readily and relate to the history they have or will study. 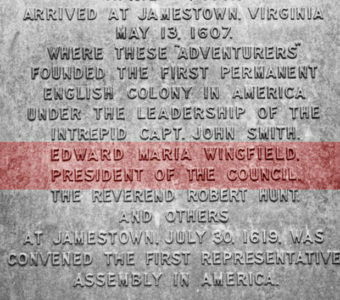 Vance volunteered to make the trip to England principally to represent the WFS and Wingfield name since the first president of the colony was Captain Edward Maria Wingfield. 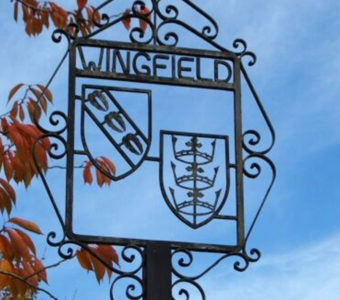 The Wingfield coat of arms is on the tapestry and this is where the first stitch was made in the midst of photographs and TV cameras. 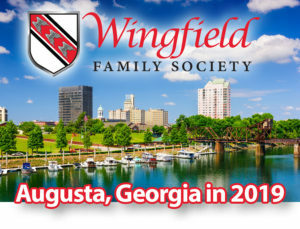 Vance made a short speech and then read a message from Wilsie Wingfield Carr, president of the Wingfield Family Society. The New World Tapestry was for a time the largest stitched embroidery in the world, larger than the Bayeux Tapestry. It depicts English colonisation attempts in Newfoundland, North America, the Guyanas and Bermuda between the years 1583 and 1642, when the English Civil War began. 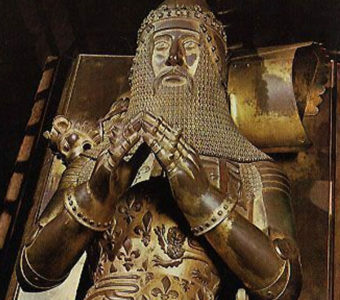 Work began on the tapestry in 1980 and continued for twenty years. The tapestry’s home was the British Empire and Commonwealth Museum in the original 1840s terminal station designed by Brunel near the modern Bristol Temple Meads railway station in central Bristol, England. This museum has now closed and the collections are cared for by Bristol Museums, Galleries & Archives. The tapestry and the rest of the collections are in storage.